You can also try adding some fun embellishments. I’ve added rick rack to my table runner- you could also try adding buttons or pom pom fringe for easily adding some extra “cuteness” to your project! Looking for more quick “lunch-hour” projects?? 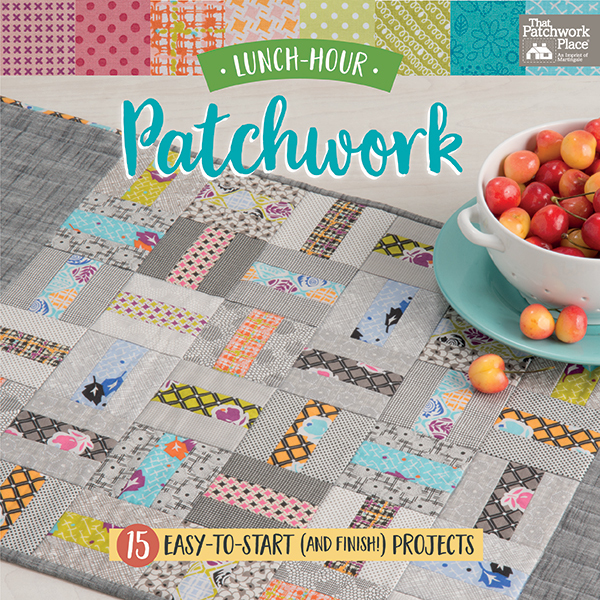 Check out the Lunch-Hour Patchwork book from Martingale! It has lots of cute projects that you can put together in small chunks of time. –Please comment on THIS blog post (not on a different blog post, not on Facebook, etc.) and tell me: What’s your favorite kind of small project to make? –Comment by 11:59 pm EST on Sunday March 4, 2018. –Be sure that your email is in your profile information or in the comment. If I choose your name and I cannot contact you, I will choose another name. –Open to US and international readers. –Winner will be chosen at random. This article was posted in Art-Design-Business, Featured, Sewing & Quilting, Sewing/Quilting Patterns, Spring. Bookmark the permalink. Follow comments with the RSS feed for this post.Post a Comment or leave a trackback: Trackback URL. Your table runner is sweet! I don’t have a favorite little project…I keep starting big ones:) Actually, I take it back, if you count baby quilts as small, they are my favorite. My favorite small project is mini hangings – no larger than 14×14 -that I change out frequently. Most are hand embroidered or applique with hand embroidery. My fave is working on the BOMS and pot holders for gifting. That is an adorable table runner. The book sounds like just the thing for me..quick start to finish! I would love to win this project it wouls be soooo awesome as I love small projects. My favourite small project would be making baby quilts. My first quilting projects were queen size quilts so my small projects now are quilted bags, lap quilts, table runners, pot holders, etc. Most of them were for gifts. My favorite small project depends on the mood – lap quilts, panel wall hangings, totes, dolls. Love them all. Oh I just love this table runner – I plan to make it in traditional Easter egg colors – can’t wait! My favorite project (small) to make would be a mug rug. My favorite little project is a paper pieced hexagon zipper pouch. The book looks lovely, thank you for a chance to win! Neat runner! Love making Charity Baby Quilts! Thanks for the giveaway! I enjoy making table topper size projects like your Small and Sweet Minis from 2016. I am learning to FMQ and projects those size are perfect for practicing! Thanks for the chance to win! I love making place mats. Thanks for showing us this table runner, I love the colors. I love making table runners. The go pretty fast. Thanks for the chance to win. I love to make table runners, I always try to have a selection for quick gifts, add a homemade goodie or bottle of wine! Beautiful table runner! I like to make wall hangings, but my newest thing is to make bowl cozies so I stop burning my hands when taking things out of the microwave! I enjoy making table runners. I know I can finish one in a timely manner! Love your table runner and adding rick rack makes it super cute. I love to make small bags to use as gifts. Super fast and can fill them with lots of cute things. Thanks for the chance to win this wonderful book. I love to make items like mugrugs, potholders and trivets. I guess you’d say kitchen items! I always have a small carrier with either hexagons or yo-yos in it, which are my favorite small projects! Little pouches/purses. Trying out the ones with an old tape measure cut for the snap closures now. Also baskets. I love making small quilts to use as table toppers. Right now I’m making kitty themed gift bags, fabric baskets, pillow cases, and other small items for a fund raiser for the pet shelter where my sister volunteers. Love the table runner . Quick and easy and great gifts! I enjoy having a completed project in a short period of time. Hi, I love this table runner! My favorite is finishing a UFO. It feels so good!!! While I am retired and no longer have an official lunchtime, I find I am busier than ever. Would love some smaller projects to give me a sense of accomplishment! Love this little table runner. Thanks for the chance to win! I love to make small bags! I love making place-mats and table runners, it’s a quick easy way to add some fun variety. I love to make small projects that I can put up on my door at work on on the side of the desk shelving unit. I use table runners a lot to add a little color to beige/white walls at work. I love those color combinations you used. I think that gray was perfect in it! Small little projects have captured my fancy just now, while I am finishing those UFO’s that I have promised myself I will get done. I love to make mini quilts to use as wall hangings. I just started quilting and just love it. I am always looking for small projects to finish as gifts. I love sewing. Thank you. I love stars of any kind! Thanks for the opportunity to win this lovely book. I am enjoying making the microwave bowl cozies right now and have given some to my favorite people who warm soup or cook oatmeal in the microwave. I actually taught the high school daughter of a good friend how to sew recently and that was one of the projects. I also love making pillowcases using the burrito method! This book looks great! My favorite kind of small project to make is a tie between mini quilts & runners. Thank you for the giveaway! I have a whole collection of small project ideas for using up my fat quarters – small drawstring bags, zipper pouches, pot holders, even fabric bookmarks – I love to sew a small project up and make it part of a gift. People love to receive something homemade! My favorite small project is mug rugs. I’m in love with them. I’m learning you can pretty much turn anything into a mug rug and I like having them sitting around my house! I really like to Lunch Hour Patchwork Runner. One of my favorites. I love to make table runners but I also like to make mug rugs and pot holders. I have been making lots of mug rugs. I even made one for myself, ha!! Would love to have lots of small projects to make that are different. My favorite small project is “small” pillowcases for a travel pillow. I gift these to family and friends. They are always amazed as to the ways they find to use them! Love the tablerunner, and thanks for the giveaway. I like to make pot holders and mug rugs. My favorite small project is a seasonal mini-quilt or table topper. I sew so slowly that nothing is that quick! I do like mini-quilts because I try to learn a new quilting skill and also improve my actual quilting. I make one block potholders. It gives me a chance to see if I’d like to make a whole quilt out of the pattern. I like to make small zippered bags & table runners. I ENJOY MAKE PLACEMATS TO GO WITH THE SEASON . I love to make small quilts and pillow cases to donate various places. Also love to make tote bags and seasonal wall hangings. My favorite projects are table runners, small wall hangings, place mats, and coasters to match. I really enjoy small wall hangings and placemats. Really enjoy all types. I like to make children’s quilts to donate to charity. Right now I’m enamored with pincushions and small embroideries I plan to put into a quilt block. Totes and table runners are my favorite-quick results! I enjoy making small projects because it gives me a feel good accomplished feeling. So many of my projects are quilts. This is darling and one I’m sure to do. Thanks for sharing. I love a mini quilt. You can make the same design as a big one, you are finished faster and you might still be able to find a place on your wall for it! My favourite small project is a mug rug followed by placemats. Sometimes they become sets. I love your table runner. I have not tried to make any small projects, but I think I would like to make pot holders and mug rugs. I tend to procrastinate and then I see something else I want to try and off I go again. I love the table runner. I hope to make one in blue and white with a touch of another color. I love making things for my home etc. tissue box covers, table runners and toppers. I make lots of small charity quilts for the guild. I just finished making valances for my kitchen. I just love to quilt and sew. My favorite small projects are baby bibs and mug rugs. I love your table runner and the spring colors. I like to make table runners. They make nice gifts. I look forward to seeing this book! I loved this blog. That table runner is sweet and cheery. I will definitely make this, possibly making it more like a table topper by adding more blocks. My favorite small project is probably making mug rugs in the hoop on the embroidery machine. So much fun. I like to make them for friends JUST BECAUSE. I do have another small project I like to make – mini wall hangings. Pretty little hearts, patchwork, etc. Cute runner, nothing more gratifying than a quick project! I love making table runners, they are quick, easy gifts for friends and family. As a member of our guild retreat committee, we are always looking for quick, easy ideas(since we have to make about 40 of each item) for our retreat attendees any help we can find for super cute ideas is welcomed. I love making quick and fast projects because I can surprise someone with a gift fast. I like to make small wall hangings, so they add just a little bit of color in different spaces. Kitchen towels! Sometimes they have parchwork, but I have been doing flour sack embroidery for the past couple years and they turn out so freaking cute because I USE YOUR DESIGNS! You are a rock star, hope your bulbs bloom soon. I adore the cactus/ bird you painted! I love make table runners and small wall hangings! My favorite small project to make is zippered coin or cosmetic bags. My favorite projects are table runners, wall hangings, & mug rugs. I love applique–raw edge or machine embroidery! I love this blog. I like to make small table toppers. They are quick and easy to do. My favorite small project is table/counter toppers. I make them for all the seasons. I love your table runner. I like making table runners and little bags of various sizes for my own use but mostly for gifts. They are quick projects – I can use up scraps and they are fun to make – Cheerful projects to give family and friends in all colors! For small projects, I enjoy making table runners or wall hangings! Thanks for the opportunity to win. Sounds like an interesting book! I love to make children’s quilts. I have used machine embroidery in blocks and give it a scrappy look with a lot of bright colors as frames around them. It puts a smile on this grandma’s face! I LOVE THE SMALL QUICK PROJECTS…SINCE I WORK IT IS HARD TO FIND TIME FOR THE LARGER ONES…AND I TEND TO START OTHER PROJECTS IN THE MIDDLE. I love making potholders. They are quick and easy and make a useful gift item. I also like to make and give hand and foot warmers. They too are quick and easy and much appreciated. My favorite small projects are table runners. Big enough for piecing, yet small enough to quilt on your own. I love your table runner! My favorite type of project is mini quilts—I seem to be addicted and have a whole pile of them waiting to be hung up. My favorite kind of small project is pretty much any small project. But mostly pillows and table pieces. My favorite small project is making a mug rug, fabric basket. Favorite small projects…..hmmmm…….runner, table and bed….candle mats / mug rugs, door hangers for the seasons…. I love making zip pouches as a quick project. Lately, I’ve been making doll quilts too. I love your table runner and all your other projects that you’ve shown over the years. I find satisfaction in creating small projects especially when I can’t seem to get ahead on the larger projects. I have made: seasonal pillow covers, table runners, tote bags, place mats, wall hangings, baby quilts and doll quilts. I especially like to make things for my family and kids at church. I especially enjoy tablerunners! My goal is to practice free motion quilting. Tablerunners are the perfect project to genuinely practice! I love following you and trying new fabric combinations! Thanks for your inspiration! Hi, I love your designs. I really like table toppers and table runners for quick projects. I would love to win the book. Mug rugs I don’t have much time so these are my go to projects. My favorite small projects are baby quilts and table mats. Thank you for the new pattern. Love mug rugs and table runners! I love making small wool wall quilts or mini pillows. They are easily portable projects and I am always on the go! Thanks for doing this. Table runners are the bomb. Quick and easy!! Potholders. Everyone needs potholders!!! For small projets I like Table Runners, Pot Holders, Mug Rugs, Tissue Boxes-small usable things. I love sharing them with friends and family. 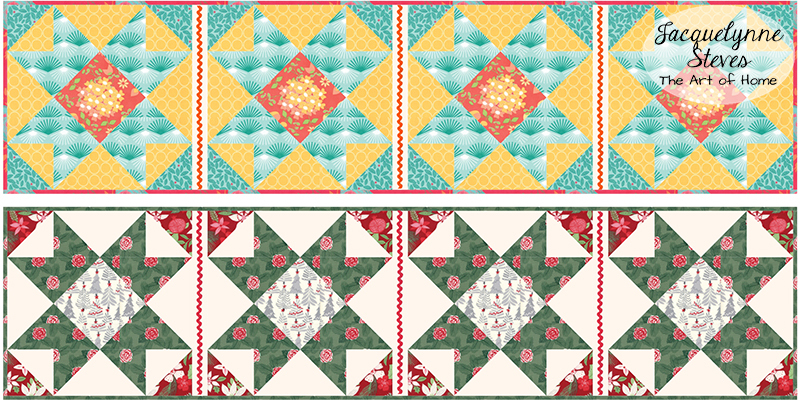 I like Mimi Quilts so I can try to learn free motion quilting. Thanks for all your help and giveaways. I would love to make the item shown with the small square (with 3 sections)-not what that is called. My favorite small projects are baby quilts. I have 8 grandchildren and 5 great grandchildren so I make a lot of baby and small quilts. I like to make encouragement pieces with phrases or medals with words and send them to people I know who are having a challenge in life. I like making crib quilts and miniature quilts for my granddaughters’ dolls. Pot holders, I like to call them my “kitchen quilts”. My favorite small thing is probably mini quilts for the dogs and cat. My favorite project has been monthly banners. I love decorating and changing things out for the month and/or seasons. I love doing mug rugs and table runners. I like make small wall hangings so I can change them out regularly and also give them to friends and family. Thanks, Jacquelynne, for the giveaway. By far, my favorite mini project is the zippered pouch a for quick gift or useful storage. Can never have enough! I love mini quilts for me and table runners for others. I love your table runner! My favorite small project is placemats that I make for my guild . We donate 100+ placemats every year to the Commission on Aging Meals on Wheels Program. I also love to make table runners for my home. I love making table runners than can also be wall hangings. They can also be a bed runner for a single or double bed depending on how long they are. If you have a double window they can even be use as a window topper. If you make a slip poker in the back they can even become a bench pillow. So many ideas with a table runner! I just love the star pattern because we can use so many of your embroidery patterns in them. I like to make burp cloths and tea towels…both to give away. I really like your table runner. My favorite small projects are doll sized quilts. They are cute and quick and can go so many places. Thanks for the chance to win. Love this table runner! Can’t wait to make it. One of my favorites is quilted tote bags. I always find a need for a cute tote bag! My favorite small project is making placemats. I also like making Christmas tree ornaments. The book looks amazing and I would love to win it. your table runner is lovely. my go to small projects are pillows and placemats. Thank you for this delightful table runner pattern. I luv chickens so the French Hen is a definite must make. My favorite things to make would be fabric bowls. Just love making holiday decorations as well. Thanks for this – love your work. Love your spring table runner–it would be perfect on my table too, so I hope I win the book. My favorite small project is a wall hanging to add to my rotating display collection. I like making pillow cases for people. When I make a quilt for someone I try to make pillow cases to match. Everyone loves that extra touch. I love making “Couch Quilts” (my term). I look at all types of patterns and incorporate parts that I like to make something original. I have made big quilts for my kids and they are special, but I like working on the “Couch Quilt” size, those are my small projects. The pattern on the book front appeals to me. Who doesn’t have a million scraps that work for that project! Everyone have a great day, hope you have time to sew today! I like to make small zipper pouches and small wall hangings. This book looks to be very interesting. My favorite small project is a wallet/card holder that I can use daily. These get so many delightful comments, are quick and easy, and very useful! My favorite things to make are small wall hangings. Love your table runner! Mug rugs are about the smallest I’ve done, typically baby quilts. Have made table runners but want to do some smaller table toppers! Your patterns look great! I love to make 12″ mini quilts and table toppers to decorate my home as the seasons and holidays change. Thanks for this wonderful give-away. I like to make table topper and runners. for all seasons. I enjoy giving the away. Currently, my go-to mini projects are Wool Hand Stitching Projects. Still working on UFO’s from the Fall. I like making mug rugs. They are quick to make and I can try out different techniques. Plus, they make great gifts. Beautiful Tablerunner.My favorite smalls are Mugrugs and Christmas Ornaments. My favorite small project is a table runner or topper. I like being able to start a project that can be finished quickly. j’aime bcp ce chemin de table. Je ne fais que des petits projets (les grands restent au fond d’un tiroir, inachevés!!) je fais des petits sacs et des tapis de table avec des couleurs gaies. I love this table runner!! I enjoy making pot holders with a matching apron. They make cute quick gifts, and always seem to be appreciated. I look so forward to your emails and projects in my mailbox. 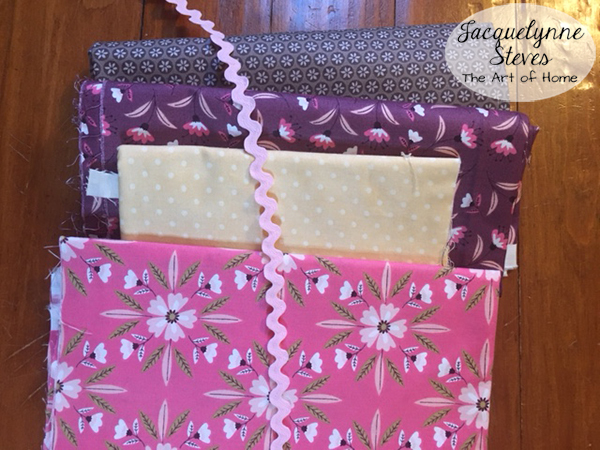 I love to make quick projects – mini quilts and quilted zipper and drawstring bags. This book looks like fun! What a delightful idea! I would certainly enjoy having some fum little projects that finish quickly. I love the idea of a table runner, but I’ve never made one. I’ve only been quilting a short time and have only made one large quilt and a couple of baby quilts. Thank you for the giveaway! My favorite small project is a zippered bag. I make various sizes and all seem to be put to good use. Don’t laugh now, but my favourite small project is stuff like machine darning towels that have small holes, or tackling something that always seems hard before you try it, like taking in my son’s jeans so they are narrow legged instead of flares. It is a quick feeling of accomplishment and my fixit pile is shrinking! Love the table runner. Small projects includes pillows, pin cushions and small wall hangings. I love making small table runners that I can use on window sills and end tables. Love little projects and these are sweet! I have a table frame that 12 inch quilts fit in. My favorite thing to make is calendar quilts for it. Lovely table Runner and very useful for using up fabric scraps. My favourite small project is fabric coasters, good for presents for non-sewing friends. It is always good to do some small projects now and then and take a break from the bigger project! I enjoy making needle keeps and pin cushions. I have quite a collection but I do give many away as gifts. They use up scraps and they make me smile. I like all small projects, especially mini quilts, mug rugs and potholders. Mug rugs, pot holders and table toppers are my favorites. My favorite small project is a prayer flag. I just love how creative these can be. Thank you for your inspiration. I enjoy making small projects like mug rugs, eye glass cases, and hot pads to donate to the yearly sale whose proceeds go to the local no kill animal shelter. I have quite the stash and need more ideas to hone it down a bit. Thanks so much for inspiring us. My go to small projects are placemats, potholders and snap purses. They all make great gifts. Always enjoy your posts and projects. Thanks for such a nice giveaway. Small wallhangings. Thanks for the give-a-way! I love to make table runners and table mats. I have them all over the house and change them with the seasons!! If they go missing off the table, I know one of my girls have been there!! My favorite small project is a baby quilt. It seems to go quickly when there is a deadline! I like to make small holiday themed wall quilts. Love the spring table runner! My favorite small projects would be little bags, pillowcases, and small table toppers. Quick and easy! Thank you! I love making panels to hang on my front door. They are quick, fun, and perfect for trying out new techniques. My mom is the “Queen” of table runners. Almost every flat surface in the house has a table runner on it. I help her if the pattern has applique pieces. I know that she would love a book with new patterns. My favoritr small projects are crib quilts, which I donate to charity. I like to make table toppers/runner and seasonal door hangings that are on my front door that face outside. Mini quilts, table runners and baby quilts definitely. My favorite small poet rblerunners and pincushions. Love them both! I like to make pillowcases and mug rugs for quick projects. I usually make them as gifts and recipients seem to really like them. I love making small table runners and toppers. I always have a small embroidery project in the works too. My favorite small project is mug rugs. I love making them! my favorite small projects are crib quilts which I give to charity. I like making small wall hangings & postcards. My favorite small project is either a tabletopper or potholders. Everyone needs them and will use them rather than keeping them in a closet. as a previous person commented I usually start big projects like quilts. However I do enjoy small embroidery projects. I really enjoy your newsletter and seeing all the lovely colorful projects you present. Thank you! My favorite small project is an applique/pieced wall hanging or table runner. I would love to win this book. My favorite small project is a seasonal wall hanging (less than 18″x18″) to hang on my front door. My postman’s mother was a quilter, and he loves to see quilted projects when he delivers packages. He often comments and remembers something his mother has made. It seems to make his day brighter, and I know mine is brighter, too. I love small projects containing embroidery, patchwork and seasonal themes. I love making small table runners and smalll purses. I make pot holders after practicing a machine embroidered design and placemats and table runners to try free motion and walking foot quilting. I have enough quilts and find small projects great to have on hand for gifts. I also have a cloth purse with wooden handles that I make frequently incorporating machine embroidery and different sewing techniques. I enjoy making table runners, place mats, mug rugs, and hand embroidered quilts (mostly baby). I would LOVE to have this book. I luv to create mini scrap art quilts! I luv your lunch hour project book….it would make a great addition to my library. Thank you. I love making small projects as gifts: wall hangings, mug rugs, table runners. Thanks for the give away. Would love to win. Bowl cozies for the microwave. Such a useful item when warming your soup/chili in the microwave. Love making table runners and placemats because they get finished!! My favorite item to make is a table runner! They are quick to complete and give a sense of creative accomplishment in the chaos of life! Thanks for the new pattern! I love making table runners and table toppers. I will definately be making this one. It is so pretty. I have been making small bags. I love baby quilts and pin cushions. my email is lindadunavan13@gmail.com Have a great day! I love to make table runners. In between my bed quilts and when I want something quick to do, they are perfect. My favorite small project to make is a quilted wall hanging usually no larger than 15×15″ I also love making mug rugs and potholders that I usually give away. Thank you. I love to make table toppers and pillowcases to give away. I love small projects so that I see results quickly. Most are for my granddaughter or my guild to put in their silent auction. I love making wallhangings to change out for the seasons of the year…. I like to make table runners and toppers. I like making potholders..they are fast and use up scraps and make great gifts. Thanks for the great pattern. My favorite small project is a mug rug. I would love to have this book, thank you for the chance to win it. I like to make dumpling pouches. They are quick and easy and I like to have one for every season! I love making bags and embellishing towels…buy I’d love to try one of these projects! I love to make wall hangings, table toppers, pincushions, bags – too many to list!! Thanks for the opportunity to win. 10-minute table runners are only one of the items I like to make. I can make them as a quick gifts or a quick decorating change for myself. I used to do a LOT of duplicate stitch, I could take it with me wherever I went. I need to find a new take along project to do while I sit waiting for hubby at the VA.
My favorite small project is a runner…whether for table or bed or a teeny one to use as bell pull or door ornament. They are quick, easy and are a great way to “audition” blocks to see if I want to make enough for a large quilt. If not, I will still have a few to turn into a favorite little project. Thank you for a chance to win. The book looks great and your spring table runner pattern is a WINNER too! Table runners, bed runners, lap or baby quilts and wall hangings are my favorites. Made one king size bed quilt, but I made it in sections. Thanks for giving me a chance to win. Have a great day. The colors you use in all of your patterns are so bright and cheery they always make me smile! I would love to win!! I don’t have a favorite small project Amon bags, placemats, etc. My favorite small projects to make are mug rugs and pot holders. SMALL, QUICK, FAST. I can’t stay focused to finish. So pot holders, table toppers, placemats, wall hangings. I don’t have a favorite small project. I like making a variety of things like mug rugs, table toppers and table runners. I plan on making a table runner for my dining room with your cute pattern! I like making pouches for quick gifts. Something useful! I love little zippered bags, tote bags, pot holders, baby quilts, pillows, needle holders, sewing machine covers, etc. It is fun to personalize them with favorite colors and pretty fabrics. They make wonderful gifts and I know they have a real purpose. When I look around my sewing room, there are things I have made and I use them every time I sew. Love that! Pincushions are quick and fun to make. I love to make table runners! I love to try new techniques and see what I like to do for bigger quilts! I love to make pin cushions for a quick project, but lately i’ve been making doll quilts for the Salvation Army to give out at Christmas with the baby dolls. thanks. would love the book! Love your tablerunner…and that is what my favorite small project is! I enjoy making for so many reasons: I can usually find enough fabric in my stash to make the top; the backing and the batting can be pieced using smaller scraps I have leftover from other projects; they are easy to make with a monthly or seasonal theme; they are small enough that I can machine quilt on my machine; and they are great practice if I am trying out a new pattern as well as to help me improve my quilting and binding skills. I love Table Runners! Quick to make and finish! Small projects are my favorite! recently I’ve been making small pouches, drawstring bags, and needle books. I love small quilts have made lots of Jo Morton’s in the past but I love all things small.I also enjoy working on small embroidery projects. I like making small projects. I have a little wooden (wallhanging) house that I use to showcase these little quilts. The tablerunner is beautiful, love the colours! I like making table runners. They make great gifts. They have instant grantification when it comes to finishing them. They allow me to make a new block to see if I like it enough to make a full quilt. They brighten a room with color. I can’t think of a reason not to like table runners. Right now my favorite small project is pillowcases for the Million Pillowcase Challenge. I like small project to do in between my quilting projects. I particularly like to do small throw pillows. I generally make them with envelope backings so I can just change out the covers from season to season. Love your table runner pattern so may do that as well. Thanks for all of the free patterns that you provide. Seasonal wall hangings and table toppers. They are fast and fun! And love miixing it with cotton fabric…. The best small projects for me have some hand stitching. My favorite “fill in” projects are all things between coaster and table toppers of all sizes. I call them ‘fill in” because I find myself more relaxed and productive working on a small project between large porjects. I like to make mug rugs for every season. Lots of them to put everywhere and also to give to friends. It’s a toss-up between table runners and purses! They are both are quick and easy to make and they also make great gifts. I love making quilted doll blankets for my granddaughter and her friends. I also enjoy making them small quilted totes to put their dance clothes in. I love a good miniature quilt, especially if I have time to sew it by hand. They seem to be easier to work with if you sew them by hand and I can work on them in the evenings while I’m watching TV. I enjoy making mug rugs, placemats and tablerunners as gifts for my friends. I love making table runners for my small project and also small to medium sized wall hangings. I sew enjoyed making the French hen wall hanging of yours. I love making table runners and wall hangings as fun, easy gifts for people. My favourite small projects are table runners and cuddle quilts for our local children’s hospital. I love makimng baby quilts , for little kiddos. The colors are so great together. Have a grand daughter who loves pink and purple so would use it to make her a new quilt. Love your blog and all the great hints and patterns.. Thanks for the giveaway. I like making blankets mostly, I really want to try more though. What a Nice book with Cute Projects.. I like to make Mug Rugs or Potholders ~ you can be creative with Patchwork or with Appliques or combination of them both. I love working with color in my creations.. most are my own design and style. I love making small projects and mini quilts are my favorite. I like something I have an excuse to use since it will cheer me up each time I use it– a little embroidered bookmark or journal cover, a little zippered bag (the best! why do I have so many trinkets to go in them??) or a mug rug. I love trying out a new idea without the stress of a large commitment. My favorite small projects are table top items, pot holders, table runners and mats, etc.The fabric line chosen is such a pretty happy collection. I enjoy mug rug sized projects. Making several at a time so I can give them to others. Thanks for all you inspiration and little projects too. I love making table runners. I love the different patterns that I can incorporate to match the room decors that I/others have. Thank you for this giveaway. My favorite thing to make is mug rugs. I like making small projects – table toppers or mini quilts just to make home feel more ‘homey’. My favorite small project is fabric boxes or baskets.I like to try different patterns and I use the boxes to give gifts in. I love the colors in the fabrics of your table runner! My favorite thing to make is mini quilts that I can put together quickly and hang on the wall. I also love making small items, but I have made large quilts as well. Your book looks very interesting, if I should not win will you make it available in the near future?? Thanks for letting us see the new items. My favorite small projects are table runners, wall hangings and mug rugs. There is something so satisfying in being able to complete something in one or two days. I love the Spring Meadow table runner. I’m thinking of using greens for St. Paddy’s day. I love making rug mugs and wall hangings as small projects. My favorite small projects are zig zag table runners. I love the table runner. I have an unfinished runner in my UFO pile. I am working on my second baby quilt. I love to make 12″ mini quilts for all my family. I gave them all little quilt stands, years ago, and make them mini’s for the stands. I like to make potholders and table runners. I enjoy making small wall hangings and doll blankets. Always looking for new ideas. Love the bright and fun colors you use. I love small projects of any type because I’m in love with miniature anything. I’ve loved mini replicas since I was a little girl. In Quilting I Love table table toppers and mini wall hangings. I am in love with mug rugs right now, and I do like to make potholders to try out new patterns. But I certainly am going to make your tablerunner featured in this blog. Thank you for the gift. I love to do improve blocks with random scraps. They can then be put together with or without sashing to make tablerunners or quilts. The blocks alone make great pot holders! Most of my projects seem to take years so when I need a bit of instant gratification of finishing a project, I tend to gravitate towards table runners or toppers. O love small projects. Table runners are my favorite. Table runners, place mats and napkins are my small project favorites. I’m addicted to mug rugs right now…guess what everyone getting for Christmas!! I love all small quick projects. It’s so satisfying to go from start to finish in an afternoon and have a cute little mug rug, pot holder, table runner or zipper bag. This book was written for me!!! I stay at work at lunchtime and sew or quilt!! My favourite quick project right now is the bowl cozies!!! I’ve been making them for family and friends!! I like table runners, bags, and kitchen decor for small projects. Thanks. I love to do table runners and tabletoppers. Also love mug rugs and they are usually quilting/embroidery combo. Love your blog! I love all things quilting! I enjoy making small items such as mug rugs, table runners or wall hangings which incorporate hand embroidery or machine embroidery and modern quilting designs. I love to make tote bags. They are quick, easy and a great way to use up scraps. I make gift bags too. My family stopped using wrapping paper about 10 years ago. My husband loves the fact that I use up my fabric stash and we don’t spend money on wrapping paper. I look for fabric at thrift stores. Things like sheets, curtains and table linens can all be re-purposed for bags or lining. There is always a stack of bags in my present box. I have been known to trade a meal from my adult daughter for a couple of bags. I get a cooked meal and more time to sew. Win! I love to follow you and the free patterns….thank you! My small project is making mug rugs. Table runners are my favorite though….even though they are not small. Love the colors in your table runner. I enjoy small seasonal wall hangings that I can swap out thru the year. I love the table runner! For small projects I am making hexi’s for a large quilt. I like to applique’ on hand towels for gifts to have on hand. The book looks like it has many cute ideas. I like table runners, bags and kitchen things. Thanks. Small projects are great, as they usually work up quickly. I enjoy working on mug rugs, zippered bags, and table toppers. I love to make mini wall quilts. My small favorites are table toppers — they brighten a room so beautifully — or kitchen towels. 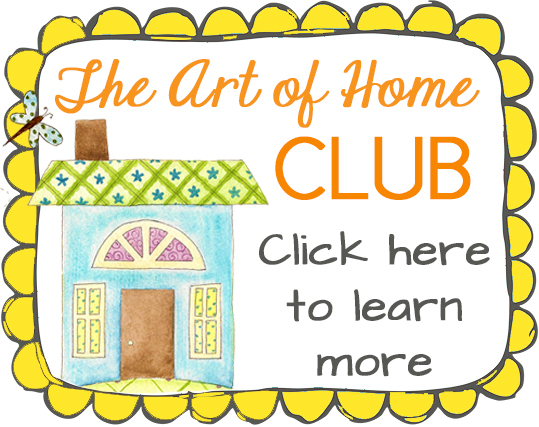 Thanks for your great blog and quilting ideas! My favorite small project is table toppers! There are so many choices and you can finish them quickly. I also like to make pot holders from the smallest scraps! I like to make table runners and small wall hangings of course there are the small bags and mug rugs and I could go on and on! I love making mini quilts. When a big project seems to be taking too long, I can make a mini, including quilting and binding in a day or two, and then that helps get me get back to a bigger project. Plus I have something beautiful to look at. Or give away. My favourite small projects are pot holders & placemats. My favorite small projects are table runners and pillows! I like doing mug mats. It’s so nice seeing purple and pink and the patterns in the fabric are cute too. My favorite small projects are tablerunners. My 2nd favorite are mug rugs. I like to make mug rugs for hostess gifts, doll crib blankets, placemats, and sashes/ headbands for young “pirates”! So Cute! Love quick projects. I like to do in the hoop projects on my embroidery machine. Very little sewing involved and I have a cute bag, potholder, whatever in a short amount of time. I love playing with colors and have hundreds of spools of thread that I want to use up in this lifetime. I love making placemats and your table runner is cute. Thank for chance to win this fabulous book! I’ve made a few mini-quilts for guild challenges and I’ve really enjoyed them! I’ve been looking for table runner patterns and I love your design, going to download it now! I love small quilts, especially table runners and wall hangings. But I also like to make purses and totes using quilting in some form. I love making little mug rugs or small table runners.. I just love making mini quilts! Fun and quick… and inspiring! My favorite small project is small zipper bags for my Granddaughters and friends. They are so fast and easy and the girls LOVE them. Thank you kathyb554@yahoo.com. I like making mug rugs , small wall hangings and table runners. Small wall hangings or table center pieces are my go to small projects when I feel the need to start and finish something quickly. Love this little table runner..
My favorite small project to make is table runners or doll quilts. I am a new learner when it comes to anything quilted. I have been sewing since I was 5 but never thought I would be interested in learning this. I love making smaller projects that don’t take a lot of time as I am new to this. I am looking forward to making larger projects for Christmas. I love embroidering hand towels or pillows cases or perhaps an ornament. Thank you for a chance to win this darling book. I love to make things for my soon to be due granddaughter but I also like to make oven door dresses & casserole carriers. They are so fun to make. I have been making small wall hangings for my front door instead of a wreath. They are small and easy to finish. piecing. I am wanting to make a quilt soon. I love all of your ideas and would love to win this fabulous book! My favorite small project is wall hangings.That looks like a great book to win. thank you for the chance. Little pouches or purses. It’s a good way to use up those beautiful scraps! My favorite hand projects (and I make these during my lunch hour) are hexies and embroidery items. I make mini quilts. Usually 16 x 16 or smaller. 12 x 12 is my favorite size! Mug Rugs, Christmas decorations, table toppers, baby quilts, anything I can finish before by attention span burns out. I love to make table runners and placemats. They add a new look in a snap and make great gifts. My favorite small project is a table topper. They are quick and so versatile! I just learned how to make fabric boxes, and have been using 4 patches to make them, so much fun and can make it in a day! My quick projects l love making are pillow covers for my couch pillows and mug rugs. I love to make pocketbooks and baby quilts. I love to make table runners and toppers. Seasonal fabrics make for easy decorating. I love making mug rugs! I enjoy making placemats. I love this tablerunner. Thank you for the chance to win. I like small wall hangings with some embroidery. I love most small projects, but right now making seasonal placemats is my favorite. My ninety year old mother lives with me and she loves using them at meals. I have sooo many UFO’s that I can’t start another project, but I usually do anyway. I love making small bags and small wall hangings (to embroider by hand as a take-alongs). I like to make sets of 4 mug rugs from scraps or from specialty fabric to keep for gifts. I like to make table toppers and runners, and use them as gifts and donations for our church bazaar. My favorite small project is English paper piecing which will end up being a larger project such as Lucy Boston Patchwork of the Crosses. But the paper piecing can be taken with me in a small sewing box. thank you for the opportunity to win. Love your web site. Table runners are great to make. Also throws make great gifts. My favorite small project is English Paper Piecing. I can so easily take it with me when I leave the house. Waiting on hubby is so easy when I have something to do. Love your web site. I like to make runners and baby quilts for gifts and donate them to the mission field or charity. I love to make table runners. I hae so many I need to findsomething else to make that is a quick sew!!!!!! love your table runner. I enjoy making quick projects. bowl cozies, runners and place mats have been my go to lately. My favorite projects are table runners and table toppers!! Cute and quick projects for gifts that are greatly appreciated!! I enjoy making wall hangings and table runners,just have a problem with making my binding to please myself.Would love a copy I know I would use and enjoy.Happy March! My favorite small project is a table runner or table topper. I also enjoy quilting small baby quilts for charity. This book looks like it will have lots of ideas. Thanks for the chance to win. My favorite types of projects are any that are connected with fabric. Small, large, they are all wonderful. I would love to try them all. I will need to live to be 300 years old to ever do and try all the things I want to do with fabric. I think I like mug mats or trivets, because they’re small and useful. And I’m afraid I fussy cut more often than not! Heh. Love to make table runners, table toppers, placemats, etc. Something that can be used throughout the year by seasons plus they make terrific gifts to loved ones. Thanks for all your creative ideas, love your site. I love making quilted postcards. They’re 4 x 6 and can be mailed just like a regular post card. I tend to focus on Christmas ones so I have lots to mail out to appreciative friends and family at Christmas time, but I also like having a few on hand to use for get well, thank you, and birthday greetings. They’re instant gratification (almost) and a cool piece of art for the recipient. I enjoy doing anything with some applique that way I can take it along on trips and if I need to sit in a car and wait or go out on a bench and wait I always have something to keep me busy! and quilting! I like making table runners or toppers for myself and for gifts. I enjoy making rope baskets, microwave bowls and mug rugs. Quick projects are fun and easy to share with my friends and family. I love to make pillows or stuffed animals for the littles. I enjoy making mini quilts, mug rugs and placemats. Cute runner~ love the ric rac in it! I like making minis or little table toppers when I want a quick project. A charming runner to brighten your table! I love small fast projects, especially pieced table toppers – I have a corner table I love to dress up for each season and each holiday and smaller toppers and runners fit the bill perfectly! What a happy placemat! My favorite quick project is a tote bag made wth charm squares. I love your table runner. I am working on making a table runner with left over fabric from my wall hanging and I want to start making table toppers. I enjoy making larger projects, but every now and then you kind of loose your mojo. This is when I make small and satisfying items for gifts or what not to have on hand. I keep making small projects until my mojo returns and continue on my way. I love to make mug rugs. Of course I get started and then have to make one for each of my boys and my Friday sewing group. I love to make seat belt copies for my friends to make driving more comfortable. They keep the seat belt from cutting into your neck. I selll them at craft fairs too. I would love to learn how to make this table runner the colors are sew perfect for my sisters new home. My go to quick projects are small tote/zipper bags or quilt squares for wall art. Anything I can machine embroider at some stage in the making. Your table runner is perfect for a monogram. Hope i am the lucky one. I like making mug rugs. I’m working on some for my book club now. I am in love with quilted postcards. Quick, easy, and satisfying, but most of all loved by the recepient. I like to make table topper or runner. I enjoy making potholders or table top runners. I really like table runners. Amazing how different a pattern looks with different fabric choices. Love the basket weave runner, does the book say what fabric was used? I would love to make it in the grey tones shown. I love to make pincushions and mini quilts. I enjoy making small wall hangings and table runners for a quick project. Thanks for the giveaway! Table runners or small wall hangings are my favorite small projects. In the midst of a “big” project, I will stop and start a bit of Zaka project with some scraps. It is sort of refresher for the brain strain of the big…some small bit of scrappy usefulness that will find a home somewhere I know. So Table runners go high on this list of littles, I like making them, I use them and I gift them…. I love that you add embellishments, such as the rickrack on your table runner. I like creating small wall hangings and mug rugs. I like to make mug rugs and wall hangings. My favorite types of small projects are mug rugs and small embroidery deigns to frame. Thank you for the chance to enter your giveaway. My favorite small projects are mini table runners or candle placemats. I like to take leftover fabric & make coasters too!! I enjoy making table runners but I really love making mini wool appliqué. I love to cut and bag small quilts kits for our guild. I cut them and the guild gals piece and quilt them. I love using up favourite fabrics in scrappy quilts for someone else to love! I like small quilts for my granddaughter. Wow look at all the comments! Sorry just had to say it. I want to make my first table runner from your pattern. I don’t have one so this is perfect. Making bowl cozies is my favorite small projects and everyone loves them and wants them plus they are relaxing to make. I love love love making table runners!!! They make great gifts!!! My favourite is mug rugs, as you can personalize them to a persons interest. After that bags, you can never have enough bags. I love mini quilts and have a couple planned for a friend! I love to make small wool applique projects! My favorite small project is to make one block to celebrate that month’s holiday, or one I like from a quilt pattern. I display them on my front door or give to a friend to hang on her room door at an assisted living facility. Mug rugs and table runners, I have already been looking at this book and would love to win it. Love the table runner pattern, also. My favorite small projects are fabric containers. They are great for holding all my embroidery supplies! Your table runner is so cute. Love how you fussy cut all those centers. I would like to make one like it but a little longer for the bed. Right now, I love making doll size quilts for my guild. And mug rugs too. Fast and fun. :) Thanks for the chance to win this Lunch-Hour Patchwork book by Martingale. I love making mug mats and napkins. You can never have enough mug mats and they sure lighten your mood! I make some for each holiday. I also love making small fabric bowls, they come in so handy and make cute gifts. I love making tabletoppers and runners. I made your summer one last year that was in a quilting magazine. It really brightens up a room. I love to make small quilts to place around the house on tables for all seasons. Making small quilts between big ones gives me new energy. Love wall hangings too. I love doing all types of small projects. Mostly because I can actually get them done. Large quilts take so much time and I may get one or two done a year as I work slowly. I also like the same projects since they make great gifts. So I like table runners and small wall quilts. I love making small projects – table runners, mug rugs or calendar pages. One can display a wee collection by season/month over top of a clear plastic frame on desk or table top. Great spark of color when there is still lots of snow on the ground ….. I guess it would have to be seasonal wallha tings or placemats, tho I’m making mug rugs too. I like runners too…oh my! I like it all!!! I love Christmas ornaments to make and give away. My favorite small project(s) would be placemats w/a coordinating tablerunner. Thank you for sharing your patterns with us. The runner would definitely be a great addition for the upcoming Spring. I’m glad I subscribe to your blog, always very fun and educational. I like to make hot pads and mug rugs in between my larger projects. I always have them on hand for gifts. I love to make smaller book bags with long swing handle, lined with pockets…pieced, appliqued or just machine quilted on my home machine. I would love this book!! I like to make zipper bags or tote bags as a smaller project. I’d love to make your table runner, too. I love making table runners and mug rugs my granddaughter asks for mug rugs for Christmas, ones for different holidays or special events. I adore this project – so cheerful for spring. My favorite small project is quilted pot holders and my daughters and friends love to receive them as little ‘picker upper’ gifts. I usually make several at a time and use up a bunch of those scraps that seem to multiply daily. I might just make your table runner AND matching pot holders! Thanks so very much for the opportunity to win a prize! Who does not love love love a prize?? I have a favorite little project they are pin cushions. They very fun to work on and give as gifts, cause no-one has to many pin cushions. I love to make table runners and wall hangings. For me, runners and placemats are good for using colourful scraps. Recently, I have been asked to make the little microwave containers for heating soup etc. I am always pleased to receive your patterns – practical gifts!! I love doing wool appliqué and I am working on small seasonal wall hangings. I make lots of small laptop quilts for elderly hospital patients using donated panels or orphan blocks and material from my quilting friends. I love your blog and website. You al says give me lots of great ideas with colour choices. My favourite small projects are things for my three children. As well as mug rugs and table runners. I love to keep my house bright and change it up a bit. Love your table runner. Plan on making it soon. Saw the book on their website a few days ago, would love to own it. My favorite small projects to make are candle mats and tote bags. I’m returning to quilting after a 20 year hiatus. My favorite projects right now are lap quilts, but I’d love to win this book so I’d have tons of ideas to choose from. My favourite small project is either totes or cushion covers with patchwork or aplique.They make great gifts. I love table runners and they would have to be the one thing I love making the most. They are quick and ever so handy. Fantastic to lay across the middle of a dining table to serve a meal on. I love to do baby quilts as small projects. Table runners are a close second. I love any quilt small enough to do it anywhere and that it can be made all by hand, such as mug rugs, placemats and wall hangings with appliqué and embroidery. I love sewing – I wish I was better at it, but am enjoying the learning experience of making quilts and love small projects like table runners. I love making small wall hangings and decorative cushions. We have just bought a new dining table and your runner is perfect for it! My favorite small projects to make are table toppers or table runners. I love your runner and look forward to making one. Thanks for a chance to win. I really enjoy making mug rugs that can also be used as mini quilts. I also really like making table runners and placemats. Your runner is beautiful. I am looking forward to making one! I love making baby quilts. Thank you for the chance. I have done some twin size quilts but my favorite is table runners and mug rugs..small scale and colorful..they also make great gifts…I like your designs and colors and your blog is always entertaining..I hope I have a chance at winning, there are so many of us that would be thrilled to own this give away..Thank you for what you do for us! Have a blessed day and sew on! Small projects I like to sew are place mats (one can never have enough) and mug rugs. They are quick, easy and take small pieces of material to finish. It’s so wonderful they way your web site & blog have grown and golly, just look at all the responses. My favorite small project is a skinny (2″x 8″), heavy (stuffed with crushed walnut shells) pin cushion. I have made them as gifts for my quilt groups and then sold many more for the same friends and others to in turn use as gifts. I’m new enough that almost all of my projects would be considered small, but so far I’ve liked doing baby quilts best. Thanks for the giveaway! I love to make pillows or table runners for quick projects and fun projects, thanks! I don’t have a favorite project, but work on many things such as doll clothes for my granddaughter, table runners, kitchen towels to name a few. I think the table runner is b eautiful…the colors go together so well. I love making small quilts that I donate to charities. My favorite small projects are always placemats! They go together quickly, cheer up the kitchen, and sooth my soul when I need a fix from something DONE! I almost always work them quilt-as-you-go, so when the piecing is done, everything is done. Thanks for this cute small project idea. I love to make small wall hangings and pouches. Love the colors you chose for your runner. I love your table runner! I enjoy making pillow covers, place mats, table runners and wall hangings. My favorite projects are small quilts made from my stash of Civil War reproduction fabrics. Almost instant gratification! Not middle NEEDLE books!! Lol!! I was just reading about this book over at Martingale’s website — thanks for the table runner pattern! I’m a relatively new quilter/sewer but I love putting together a single quilt block because I can use it in so many ways — pillow, mini quilt/wallhanging, mug rug…or stash it with other single blocks for a bigger quilt! I like your table runner. I like to make all sorts of small projects, they are quick any affordable. I like a small project to motivate me when I am stuck on decisions about a larger project. Tablerunners are fun and so are potholders or mug/wine rugs. Love this table runner and I am in need of a new summer one. Off to the sewing machine I go! My favorite small project to make is mug rugs. I make pillowcases for our local boys crisis center. My favorite small project is a hand-made Christmas ornament: a log cabin Santa, embroidery Christmas tree, rice-stuffed sock snowmen. Especially if it’s a project a group can do and take home in an afternoon! I like making small projects like table runners, place mats, potholders. I am planning on a bed runner and I would like to attempt a king size quilt for my bed. My favorite small projects are pillows or table runners. The book looks great. I love to make table runners. They are good gifts for people and fun and easy to make. Mug rugs or potholders are my favorite small project. Keep a couple on hand for last no,Ute gifts. I like to make place mats. I am always looking for fabric with cats on it — those place mats go to my friends in SC. She also likes place mats with holiday themes, so I made St Patrick’s Day place mats for her on my last visit. Mug rugs and other small seasonal items. Table runners are great too! Thank you for sharing the book! Looking forward to hopefully winning!! The smallest projects I enjoy working on are coasters and mug rugs and also microwave bowls! All are given as gifts!! Mug rugs are my favorite small projects. I would like to try some mini quilts too. The colors are beautiful and make me think “spring” which we seem to have one day and then back to winter. No fear another spring day will come soon. I am in to making table runners. I love tabblerunners and just love the mug rugs. I really do like to do big quilts. Oh anything that I can do just to be in my sewing room and my very happy place. I like doing small purses or mug rugs or strip blocks to save up for a larger quilt. I love to make table runners. This one is really cute. One year I made a set of holiday (all holidays through a year) for everyone in my family! I made over 100 table runners and had a blast!! Thanks for helping me to enjoy MY happy place! I love all forms of quilting – it is truly my passion. I like to make small wallhangings. They brighten up any space. I love making baby quilts and zipper pouches. Looks like a great book! I like something quick when I get tired of working on a quilt. Small wall hanging or table runner. My current quilt has 38 pieces in each block which is the hardest one yet! I love small wall hangings to make as gifts. The table runner is beautiful! I can see myself making it different colors for gifts for the family. Do all different sizes of projects. Thanks for the free chance for the book. I love making table runners! That was one of the first things I made when I started quilting. I have made so many since and it’s great because you can also make up your own design. Martingales’ has some of the greatest books and I would love to be the winner of this one. I am a shopper and a site looking at Martingales’ and they are the sweetest ladies in responding and speaking with..
My favourite small project is making pillowcases. I like to use the free patterns available for the “1 million pillowcases” project. I just love the patchwork borders and as long as I choose one that isn’t too complicated I manage to get it sewn fairly quickly. I like to make table runners or small wall hangings. I like to make useful small projects, like mug rugs, or microwave mitts, or coasters. I have seen a preview of the Lunch Hour projects and love it, but especially your table runner, I can see making it in several colorways for different times of year. Thanks for the pattern and ideas!! I love to make mini quilts to hang on the wall or then I love to make baby quilts or throw size. I hate to make king size. they are just too big for me. I love the little ones. I like making receiving blankets and small quilts for children’s charities. i like to make doll quilts. i have 5 little great-great nieces who love to play with dolls. I am new to quilting but I enjoy making small mug rugs and a simple table runner. This book looks great for me! Thanks for running the comp and hello from Australia. Wow, so many entries, but here is mine. I love the simplicity of the runner featured on the cover. Due to depression, I stitch for therapy and can only manage small items so this looks like it was made for me. I really like the table runner. I would also enjoy the projects e-book. Thank you for this opportunity to win and also the lovely pattern! My fav small project is string pieced coasters i’ve Probably made a few hundred by now! Thanks for the great pattern and giveaway! I love to make table runners and baby quilts. Love the table runner pictured. Would be great to win the book. Thanks for the chance. Love the table runner. That’s my favorite small project to sew is quilted table runners. Have daughter’s that love me making them table runners for all the holidays. I’ve got a few done but lots more to do. Love quick easy projects , so satisfying. I love to make table runners or mug rugs. They are small, quick to complete, and it is satisfying to get it done! I enjoy making and giving baby quilts. Recently I have been working on table mats. I like to make mug rugs. Also, I like making place mats. I like to do most bags and have started increasing my selection of seasonal table runners! I love the sense of satisfaction upon competition! This table runner is adorable! I hope to use a smaller version in another round of placemats. I love to make mini wall hangings for the quilting board swaps that I join, I also love to make table runners. Table toppers or doll quilts are my favorite small projects. Would love that book–Thanks for the chance! I have made from your patterns. I like making mug rugs fro my friends. They make up quickly and it is nice to have a “finish” in a short amount of sewing time. I like to make doll bed quilts as a small project. I do hand piecing and applique. The very first project I made was a sampler that I made on my lunch hours. I had a large butter container with my cutout pieces thread and scissors, I made one block a day. I made some zippered pouches to fill with Valentine candy. I really like your table runner; I have made a few miniature quilts, my favorite one is a mini yo-yo quilt in scale for a doll house bed. I like to make Tote bags and pot holders as small projects in between quilts. This is such a good pattern there are so many ways that I can think of to use it, the possibles, are endless!!! My favourite quick project is making mug rugs. They’re cute and easy to carry around to work on and are great gifts to give. I like to make some type of runner to go on the back of my husband’s Lazy Boy chair for a head rest. Love to make small projects. I love your website and your beautiful projects that you share with everyone. Your instructions are so well illustrated. My favourite sewing projects are table runners, table toppers and pretty potholders and mug rugs. The small projects I like are baby quilts, table runners, and 18″ doll clothes. Would love to make the House Pot holder the Christmas tree pic and there is pillow that looks like fun also. I love the color choices!! My favorite small projects right now are mug rugs and coasters. I like making small pouches or pencil roll up cases. I love making fun things for the house. Table runners, applique towels, and totes. This would be a great addition to my pattern library! I have quilts that ny grandmother made. They are precious to me. I would love to win this book. Quits are special. This book would be very helpful to me. I must like to do doll clothe…two 12×25 suitcases full to the brim went home with our 2 great granddaughters this last Christmas. And coasters in colors to please the receiver will be for this year. Now to get to all the pretty tablecovers! Also make seasonal door quits about 18×18. In between I read. Love to see new ideas.. I love making small quilts, but also useful little bags and totes of all sorts! I love making small things. One of my favorite things is pin cushions. I love making table runners and the calendar quilts. I just love making all kinds of different things! Thanks for the giveaway. The book looks interesting. I checked out this book and it looks great. Lots of easy quick projects! I volunteer with a special ed group, so I love to help them make small and simple projects, so that they have that ‘I made this ALL by myself’ feeling when they show it to their family and friends. That smile is worth a thousand pieces of fabric…! I love to make small pouches and bags. They are so useful for just about anything. And I also like to make personalized wall quilts to honor special occasions like weddings, birthdays, and babies. I love everything, but some kind of supercool quilted sack to put home made gifts in. Most of the projects I make are small. I especially enjoy making pillows and tablerunners. Love mini quilts, table runners and mug rug. I need instant gratification! I like to make little drawstring bags. They hold all sorts of things. I enjoy making small quilts and table runners, but find myself immersed in large queen/king paper pieced projects. I love to make things for the kitchen like pot holders. Table runners are the small projects for me, great for gifts and to brighten up a table. I like making zipper bags. They are a great use for random pieces of fabric and also make great gifts. I love to make small projects like table runners and potholders. Your book would be wonderful. I love the look of your patterns and designs. I guess mug rugs would be my favorite small projects as everything else I make is throw size or larger. I love to do mug rugs and table runners for small quick projects. I also have a few little tool holders that I do. Nice gifts all. I really like to do very colorful projects. For small projects I love making mugrugs and table runners. Coasters too! My favorite small project is quilted totes and handbags with scraps. As a beginner quilter/sewer since October, seasonal and holiday mug rugs are my favorite go to right now. Thanks for the freebies! I enjoy making small handwork projects, English paper piecing, small embroidery projects, tea towels and hand applique, fun little gifts for family and friends. I have a goto pattern for a table topper which I’ve made for several gifts. I love making table runners or table toppers. They are so fast to get done, I feel a sense of accomplishment. I love making miniature scrappy 12″x12″ quilts. I love making table toppers and table runners. It is a nice project to get quick satisfaction from when working on larger projects. My Favorite small project is a Table Runner/Wall Hanging. I usually put a hanger on the back on the Table Runner so I can also use it as a Wall Hanging. Some of the reason this is my Favorite is I still haven’t gotten to make a Full Quilt but I am working on it with a Quilt Along with NQC so I might actually have a Quilt. Only took me 3 years to get my nerve up to do the Quilt. I’m a very new quilter who’s been dreaming from afar for several years. Table toppers really appeal to me — they are small enough I won’t have nightmares trying to maneuver them. I just finished some zippered pillow covers. Really cute, really fast. I love making table runners! I enjoy making table toppers, different patterns provide new challenges. The new book looks enticing! Thanks for the chance to win! I love making table runners and tea towels! I like wall hangings, table toppers & mug rugs. I love small wall hangings – small enough to quilt myself in my small machine.. Thank you for the opportunity to win the book. Small projects are definitely my thing. My favorite type of quilt is a wall hanging, preferably with a theme. We love seasonal table runners/placemats; mine go across the island where we eat. They are not typical size but small enough to practice quilting. Thanks for the offer to win a cool book. I like making small patchwork items with my scrap collection, such as table runners, baby quilts, quilt blocks to make a mix & match quilt, etc. I’d love to win this book. I usually quilt in small blocks of time and this would be perfect. I love to make things to donate and for small gifts. I really enjoy making baby quilts. I love choosing the cute prints/solids in the softest fabrics I can find. I like to make patchwork pillows for gifts. I especially like to make them for RV and camper owners featuring fabric special to the owners of these cabins on wheels. I enjoy fussy cutting for the WOW factor. I love to make mug rugs. They make quick and easy gifts. I would love to win the book! My favorite small project would be anything to do with babies! I love making baby quilts, but when I have extra time, I love to do taggy blankets with all different kinds of ribbon, rick rack, lace, etc. I always wash a potato chip bag and put in the middle between the fabrics to make that “crinkly” sound. I love small quilts. I first started quilting using “little quilts all through the house” in the 80s. I use them for table rugs, wall hangings, accent pieces. I have been making full size quilts for the last several years, sending them out to be quilted. But my new years challenge was to learn quilting on my domestic machine. I am about 2 weeks into it. And a new fresh book with fresh ideas would be an inspiration. Morning from a very snowy UK. My absolute favourite small projects are mug rugs, I have made lots for friends and they are just the cutest way to practice different techniques. Thank you, Marion. I like making bookmarks–probably because I love books! Thank you for all the information you share! I am new to quilting and I think my favorite small project is baby quilts. Although I have been making small bags and they are great fun as well. I really love your Spring Meadow table runner. The colors are bright and springy and it feels like home. I am new to Quilting so any small projects are good for my continued learning thanks. I LOVE the new table runner. Would really like to make it for spring. I love making pin cushions. They are fun, quick, easy, and you can be very creative. Second place is table runners. Love them for gifts and to make a room comfy cozy. I love to make pincushions whenever I have time. Scrappy ones are my favorite!! I love this table runner and am searching for that special fussy cut fabric to kick start one with. Everyone in the family now has one of my quilts, so I need to focus on some smaller items to donate. This book looks like it might do the trick. Thanks for offering it. I enjoy making mug rugs, wall hangings, and table runners. They’re fun to make and add to making a house a home. They’re also a great way to learn a new skill. And above all that – they make great gifts! I’d say table runners, placemats with matching napkins, wall hangings etc. I also started quilting in the 80’s and all my family members (I have a small family) have been and continue to be the recipients of multiple quilts. I’m a member of a quilting circle at a neighboring church and make comfort quilts for those in need of comforting. I love to make mug rugs with matching placemats for gifts. Little zipper bags for gifts, for me, just for fun. I love EPP and one of my favorite projects with them is hexie placemats. I love making baby quilts. You can complete a complex pattern in very little time compared to a full bed size quilt. Your table runners are beautiful. Definitely new to my list of quilts to try! My favorite small project is a quilted hangar cover. It has a secret zipper pouch on the inside to keep matching accessories. 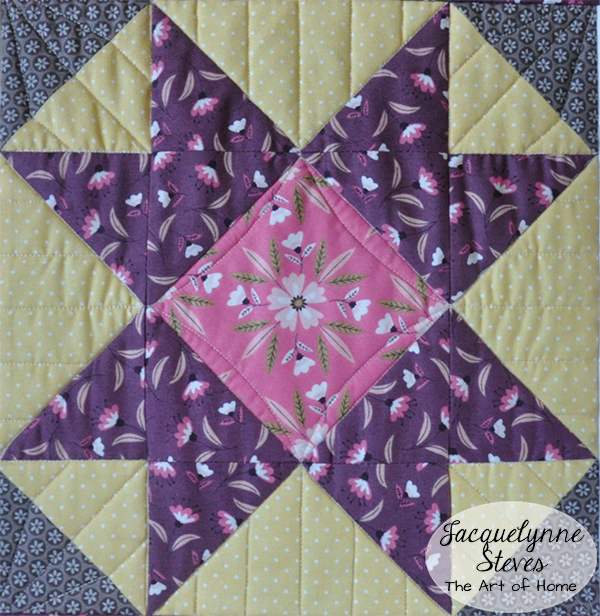 Its a great useful gift and a great way to practice free motion quilting designs on a small project. Love your small table runner. I love making small things, table runners, bags, wall hangings. I love the instant gratification of small things. I like to make table toppers, accessories, kitchen things, and more! I like to keep several small projects so that when a friend is visiting, I can give her a choice of items that she can take home. I like to make this small items from leftovers from a large project. The small projects I enjoy are those that can be completed in an afternoon. I recently cut out 100 sets for tissue holders for my mother in law to make for her church friends. We had a lovely time together. Minis are so much fun. I’m there. I love projects i can complete in a short amount of time. Taberunners are great and i love yours. My colors are dark & light turquoise with gray, off white, and small bits of green. I’m always looking for small projects to make for my family members and friends! This looks like a perfect resource! My favorite kind of small project to make is a quick and easy dog pillow, stuffed with fabric end scraps, to donate to the Humane Shelter. Instead of throwing these pieces away it helps my grandkids see the potential of recycling and to do something good for others. I love making pretty potholders. I want to start making small wall hangings also. I love to do mug rugs or a wall hanging. They are quick and so pretty! My favorite small project to make is a mini quilt. I love to be able to have an idea and bring it to completion, and then display it or give it as a gift in a (relatively) short amount of time. My favorites are table runners and small wall hangings, and I am just starting to do mini quilts! My favourite kind of small projects are mug rugs and table runners. I love love the purple prints you used! I like to make practical items I can complete in one sitting. I love to make table runners and wall hangings. I usually make one when I am in the middle of a “ah I’ll never finish this quilt moment.” It allows me a feeling of accomplishment and then I can get back to the bigger project. Also, enjoy fussy cutting when applicable. I am totally enjoying my newest passion, quilting Mug Rugs. after many years of being away from sewing except for the never ending ending, I bought a new modern sewing machine to complement my 47-year-old she.. I have made a monthly fee for the last few months and have made A couple birthday gifts. Had fun making bowl cozies for gifts and I am in the process of making baby bibs and baby burp clause for a few baby showers. This practice with my new machine is my precursor to making A quilt for my king-size bed. I am having all the old feelings of comfort return as I said at my machine. Small wall hangings and paper piecing are my favorite small projects. They are portable and easy to finish. I like doing table toppers or runners. They are quick and I can experiment with new blocks and not be committed to a whole quilt. Plus, they can usually be done in a weekend….binding and all. Thanks for the opportunity to win this book. It looks like a good one. Pot Holders! So fun to see them in use at my kid’s & friend’s homes. Table runners are a great way to practice blocks and still create a usable item for the home. Just starting to finish baby blankets that I have embroidered! With some news I recently received I think baby bibs and receiving blankets are in order!!! I like creating things especially designed for someone. For example, I embroidered a Welcome sign in Sign Language for my Sign Language instructor. I was going to make a wall quilt out of it, but she asked for a couch pillow (and loves it!!). I then make an anniversary wall hanging for my son and daughter-in-love. I’m now making a John Deere tractor quilt for my youngest grand daughter. I love to make Small quilts as a wallhanging. Nice for a new technique or a different colorcombination. I made some bowl & plate cozies last summer, along with baked potato bag. So quick & easy I plan to make more for my kids this year. I enjoy tablerunners best. They’re quick & easy and brighten my table! I have some for every season. My favorite small project is baby doll quilts for my grandbaby. I like making mug rugs for all seasons. Also may lots of bowl cozies for Christmas gifts. Nice to change to a small project in between larger ones to see it finished. My favorite small projects are Christmas ornaments and seasonal table runners. I love projects that are bright and colorful. Purple is GREAT for spring! My daughter-in-law will be thrilled..purple has not been featured in a long time!! Yea! !for you! Looking forward to getting the pattern and making one for Sam and Amy!! Ilike making table runners and mug mats. Also mini quilts.Looking forward to the give away. My favorite projects are baby quilts for OK Infant Crisis Center. Fast and sweet. I love making Table runners for my mini group friends and they love getting them. Thank you for the newsletter and all the projects you share! Your fabric choices are always so sharp. I love to make table runners and give them as gifts. Your blog is so very interesting and I enjoy receiving your e-mailes. I hope you will pick me to win the book. I really love doing baby blankets, burp rags, and bibs. All babies need lots of bibs or burp rags. I also crochet and I always try to include a crocheted blanket. I love your site and try to read all your things each month. I’m unsure that Website means down below my email address. I love your site and the little drawings. My favorite small project is mug rugs. Quick, easy and cute! Placemats, table runners, wall hangings – I like to do them all. I like to make table runners, place mats, kitchen items and embroidery. I love to use up scraps for hot pads and mug rugs and give them away with bigger gifts. Also love your table runner and will definitely make that one! I like to make placemats and table runners. They are quick and can be in so many styles. My favourite small project is to make little wallhangings that can easily changed with the seasons. I also like to make preemie quilts for our local NICU at the hospital. The little quilts make the isolettes look much more cozy. I love making mug rugs! Love your blog too! Seasonal table runners or wallhangings for my office. When working on larger projects I enjoy small projects. They allow me to take a break. I love doing smal quilts that I can give away. I love making thing that friends will use. Hot mats, bowl holders, pot holders, mug rugs. So much fun to personalize these things for them! I like table runners because they are quick and I change them often. I love to make little wall hangings or pouches…quick and easy! I love the colors you used….so sweet! My favorie project to make are just blocks. Experimenting with different patterns and the putting them in either a table runner or quilt. I have made lots of potholders! I love to make tablerunners, mugrugs, wall hangings, bags…..needle books, placemats, tablet covers ….everything and anything! And I truly love your patterns and blog. So uplifting, so peaceful, so beautiful. I like making place mats, and change them out on the table for seasons or holidays. I have to say my favorite small project is a scrappy block…..I have everything organized so I Jun sit down and whip up a couple in a half hour…..that’s why I took all the time to cut and bag all my scraps!! Sometimes I only have half an hour. My favorite small iem to complete is a tabletopper/runner. Sometimes though a small bag is the perfect way to use it up. Thanks Jacquelynne and Martingdale for this giveaway. My sewing area is very small so I tend to sew smaller items from lap quilts to pot holder, etc. Your table runner is a great project for me. The book would be right up my alley. Thank you and Martingale for the opportunity to win the book. I have already downloaded the pattern for the table runner. I love making baby quilts for family and friends! I have also make scrappy sun glass cases, hobo bags and purses. I’ll try just about anything that looks fun to give away to my loved ones! Table toppers are my favorite. I love to make table runners. Please sign me up for the book!!! Thanks! Small projects I like to work on are table runners, aprons and baby items like toys, burping cloths, breast feeding covers and small one yard quilts. Small projects offer a feeling of completion and knowing the receiver will love it just make me feel good!!! I like to make things to give away. I am retired and on fixed income, so things I can make that are small and less expensive are the best for me. Plus I like to donate things for fund raising. Hi, table runners are my favorite and also wall hangings. 💗 📚 that teach. Beautiful table runner. I prefer small projects. I would like to win this book. I like making small quilts and table runners. I have made a few quilts . Im still a beginner . Love your table runner! My favorite quick projects are round or square table toppers…both Cotten or wool. They can update a space so wonderfully! My favorite small projects are table runners and baby quilts. I make baby quilts for the NICU at our local hospital and the table runners are usually given to my daughter who loves to dress up her table with pretty new table runners each month. I love to make small Zipper Pouches, I think it is in the hopes of some day becoming more organized. Ha. Thank you for this opportunity. I’m new to quilting but love it. I like doing small lap quilts for family and friends. I love little dol quilts. I love scrappy and bright. Love that table runner, perfect for spring! Adding it to my list 😊 I love to make quick zipper pouches and small drawstring pouches. Thanks for the chance to win! Would love this book! I love placemats, mug rugs, and baby quilts! My favorite small projects are coasters, mug rugs and embroidered small drawstring bags. I love making coasters filled with lavender or double sided napkins. Quick easy and make nice last minute gifts! I am new to quilting and looking for projects that build my skills and confidence to tackle bigger projects so potholders, mug rugs, placemats, table runners, etc. Thanks for the chance to win this awesome book. Mini wall hangings and table toppers. They just take a Block or two to finish. My favorite small project is small enough to be used as a table topper or a wallhanging. I also enjoy making zip bags and pillows. My favorite project to make is a table runner or mug rug. I like to change my table runners for holidays or the seasons. I just love small projects that I can display easily. I love the colors of your runner. Very springlike. I really appreciate how you explain yourself when you use terms people may not be familiar with. My crocuses are popping up, but we are supposed to get snow this afternoon. Hope they survive. My favorite quick projects are things that take no more than half hour to do. Like making plastic bag holders. Your runner is darling! My fave small items are small 10 minute runners or potholders. Both are nice for hostess gifts AND the small runner folded nicely fits in the envelope with a card. With so very many comments on this blog it would be a miracle to win anything! Mug mats, potholders, mini wall hanging (scenic) with my leftover scraps, quick baby receiving blankets, table runners for house gifts (this one is adorable and easy-peasy!). I have a nephew and his wife who just bought a new house in Seattle (moved from NYC), so many housewarming gifts are in order now! I like to make baby quilts and table runners. Love the purple and yellow…reminds me of crocuses and pansies!! Thanks for small project…I can only make these since I work full time!! My favorite small projects (currently)would be wallhangings as I am working on a couple that just need the binding and hanging sleeves. I like to make scrappy lap quilts as they use up the remains from my larger projects & I then donate them to the local rehab facility or the senior center. I must admit that sometimes I give them to a friend too. I have two favorite kinds of small projects to make. I hope that’s OK. They are doll quilts and mug rugs. They are always very much appreciated when I give or gift them. Thank you for the opportunity to win this special book. 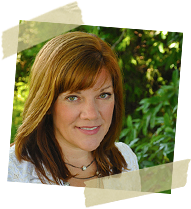 This is Louise Fredieu, and my email address is louisefredieu@yahoo.com. I enjoy doing pillow cases and mug rugs for small projects. I love making mini wall quilts. Thanks for the lovely giveaway, Jacquelynne. I like making mug rugs. This can be a good trial for a new block. I like to make table runners and mugrugs. I love patchwork stars so I’ll just have to make the Spring table runner! I love making bags of any kind. Lately I’ve been on a downsizing kick and have been making clutches just large enough to hold my phone, money, and of course, credit cards. I love small projects because I get a sense of accomplishmet. Then I can go on to something bigger. Also, if you need a quick gift they can be done fast. How could I resist this cute table topper~~ And the intriguing “half hour” quilting. Hmmm, would love it. My favorite small project are mug rugs. I think all my friends and relatives have all received over 10 through the years that I make them. And I’ll keep making them! I like table runners the best.& mini Wall Quilts the best. I enjoy making baby and lap quilts. Thank you for this chance to win my favourite is making small mini quilts for the outside of my door. (apartment). My favorite small project is making seasonal table toppers! It’s just so much fun and helps get me into the spirit of the season! I like to do small sizes like a 12×12. You can start and finish in 1 day. They also make great presents. My new favorite is “small quilts” that can be table toppers or a group of them on the wall. I like doing small projects like pot holders, hot pads, bowl covers, etc. I have so many projects in the works, I won’t have time to die. But I’m ready to start more. ^^ And I have plenty of bigger projects going, too. I like to make table runners and small wall hangings. I am still learning to quilt, so table toppers and table runners are my favorite to work on. I did just make a lap quilt, and working on my first twin size quilt! Love your site! I like making seasonal mini quilts and mug rugs. It’s nice to have the satisfaction of a completed project. I have very limited time to quilt or sew so I love making table runners, mug rugs, and potholders, mostly for gifts. Thank you for the opportunity to enter. My go to small project is most definitely pot holders! I donate them to our local hospital ‘s gift shop! I would really love to win this book. And thanks for the table runner pattern! I think I’ll make it in chartreuse, yellow, and turquoise! Boy……trying to pick one small project favorite is hard! I love to make tablerunners, wallhangings & tote bags, so I guess those are a few of my favorite littles! I’m hoping to make the spring table runner in the next week or so and take it to my sister-in-law when we get together for dinner. Thanks for this. I love making table runners. They’re fast and I can quickly learn and practice new techniques on something decoratively useful! It’s hard to choose a favorite small project because I like so many of them — table runners, zip pouches, pot holders, etc. Whenever I’m between big projects or I just want a fun little project I will make one of those things. I love to keep pot holders on hand to give them to people as a little surprise gift. Sometimes I’m amazed at how much happiness sometimes comes from such a small thing. I’ve been having fun making 12″ monthly holiday blocks to display on a stand. There are so many and so cute. I just finished shamrocks. I also enjoy making the Itzy bag – my favorite! I love mini quilts after finishing a big quilt. I need a little project just for fun. Have a great day!! Mini quilts and little zippered pouches are my favorites. Thanks for the chance to win what looks a great book! Your table runner is awesome. I love making mug rugs and candle mats. They are like making a mini quilt. Also, I do make lots of table runners. I like to make small projects for the kitchen which have an applique or embroidery on them. I enjoy making them for myself or to give as gifts for family and friends. I love this pattern for a table runner (also my favorite small project to do) because it’s so easy to change the fabrics and get another season or holiday out of it. I like anything that is portable. I mug rugs and table toppers- mini quilts you name it. I like to feel I accomplished something in small stolen pieces of time that I can find everyday. My favorite thing right now are purses for Sew Powerful, a charity helping girls in Zambia, Africa stay in school. I love table runners and your pattern is wonderful. Small projects for me are doll quilts. I like small quilts that can be hung for the different seasons or holidays. Definitely a small go-to project would be a table runner. I’ve made two in the last month for gifts. Your table runner is beautiful. I would love to win the Lunch Hour Patchwork Book. My favorite small project is to make Mug Rugs. Love the table runner. My favorite kind of projects are wall hangings and table runners. My favorite small projects are wall hangings. Thank you for the opportunity to win this book. Placemats are my favourite small project! I love all your tips and great encouragement. Since October, I have been making a 12″ X 12″ wall hanging for my daughter who lives two states away. I also make the same one for myself. I mail hers by the first of each month. We have that to share all month long and she knows how much I am thinking of her and putting love in every stitch. For March and to prepare for Easter I just finished making YOUR bird’s nest with “HOPE.” Thanks so very much for all of it!!! I have made a number of small wall hangings lately. They’re fast and fun and that’s why I like to make them. I love to make projects that are small enough to go with me in my sewing bag. I would never make a king-sized quilt!! My favorite small projects are things for the kitchen, placemat, aprons and potholders. My favorite small project is a headband for my one and only daughter. Your blog is always inspiring. Thank you for the effort you make to inspire us! I love english paper piecing. I use a lot of my scrap fabric and make mats and am working on a table runner. Love table runners for my table and they are so quick to make and even quilt on the home machine if a larger project is on the long arm frame. I like it when I can put several small projects – baby quilts and table runners and place mats on the long arm at one time and do a variety of quilting motifs and finish several projects at the same time. I love to make coin purses to make into key rings. I love making table runners but my favorite small project is Scrap book covers I make them for all new babies and as wedding gifts for friends and family. My favorite is pin cushions. The ideas are endless & their so much fun to make. Love the table runner! Would love to make one for my coffee table. Thank you for the give away I would love to win it!! God bless. I’m a beginner quilter, so I enjoy honing my skills with small projects like placemat samplers. I try quilt blocks using scraps and have a finished product that I can use and enjoy. I also improve my skills with the practice. Mini quilts- I can use for a table topper or a wall hanging! My favorite quick project is coasters. I use up a lot of scraps, do a lot of decorative stitching, and a set makes a great gift! I love small projects that give a challenge and an accomplishment of a job completed. Having small jobs to do and complete in a day or two is great. Sometimes we spend so much time on one project we can feel like we aren’t getting anything completed fast enough. So if we take a small break and complete just one small thing it makes us feel good about our own work. Knowing we can complete the big ones with the same feeling of a job well done. My favorite small project to make is a pincushion. You can never have too many and they make great gifts! I adore hand appliqué the most but many times I need a quick gift made and appliqué is not quick. I’d love this book for quick gifts. Anything with “embroidery” is my favorite project. I can’t seem to get enough of it. I love Block-Of-The-Month projects that are embroidered for each month. Thanks for the giveaway !! I am the table runner queen. Love to make then. Love to embellish. This one is soooo neat. Would love to win the book. Table runners make great gifts. I love to make table runners and small wall hangings. I love the spring runner you just posted. Please pick me to win the book. thanks so much for all your great patterns and posts. Love the little camper one and the butterfly ones. Love doing small table coverings for my kitchen table. I like making pot holders. but I think my favorite small projects to make are wall hangings. I enjoy making mini-quilts. They are easy to quilt. I would say small fabric boxes are a favourite to make. Thank you for being so generous and I’m going to give the table runner a try. I want to win this so very badly. The way my life has been lately, I could use some cheering up…I love making “smalls” – especially table runners/toppers. I like giving them away. It cheers me up to cheer up someone else. Being a caregiver for my elderly mom and husband, I need quick and easy projects….usually wall hangings. I am a cross-stitcher as well as a fabric-crafter, but my most favorite thing is to “rescue” cross-stitches that have been abandoned (!!!) at second-hand stores, and re-purpose them into decorative pillows or quilted wall-hangings and then re-gifted. I’m horrible at hot pads and things for the kitchen but I love making table runners. Sometimes when making runners you can create the simplest things yourself. Mug rugs and table runners are my small projects. I love making mug rugs. Great for gifts and favors and for me too! I love mugrugs! Little quilts to give as gifts or display around the house when I drink my tra. I love to make table runners and wall hangings. I am amazing an amazing collection of the wall hangings for my front door. I am constantly changing them. It’s fun! My favorite small project is a wall hanging. You can be creative and try out new techniques in a small space. Love the new book! I love making seasonal table runners, placemats & wall hangings! My most favorite small project has to be small zipper pouches. They are so many for all kinds of things. I love making Potholders & Aprons for gifting! I love making pot holders (especially love all the potholders from the Vintage Farm Girl) – they are quick, easy and make such great gifts. I like making miniature quilts. I use them as table toppers, dresser scarves, and wall decorations. I love making table runners and tote bags plus reusable bags for children living in CA. I have made a few mug rugs but need other ideas….Love to use serger to make quilts. I love making stuffed toys. My favorite is a baby quilt! I love to give them as gifts. I also hand embroidery the name tags. I hope my quilts are cherished for many years and bring warmth and happiness. Thank you for sharing all of your patterns and ideas. I love making, giving, and receiving small bags (even larger totes). I love making zipper bags, they are quick and you can never have to many. my favourite small project is table place mats as i can play around with FMQ a little. My favorite small projects are trivets, placemats, lap quilts. Table runners and table toppers are my current favorites right now! I like making bags, with quilted outer pockets. First I want to say I love your blog and have learned so much from them. I love to make table runners, small purses, aprons etc. With my husband in rehab I can work on these small projects while I set with him. At home I love all types of patchwork quilting. I love whipping up easy makeup bags and totes, as well as table runners. I’m needing new ideas to keep me happy before I get bored! I like making pillow cases for my grandchildren. I love doing table runners for any and every occasion. I love to make table runners, placemats and small doll quilts for my granddaughter. I like to make smallish bags to use up some of my scraps. Love your table runners. Hi! Here I am with my comment–way down here on the bottom. I must be number 3000 by now. It took me forever to reach the ‘Post a Comment’. I make 1″ 9-patches and save them for when I need a gift bag, wrist purse, or mug rug, table runner, placemat, or cell phone holder, notebook, checkbook cover — whatever. So easy and makes a little giftie special. Little 9-patches come in handy for fundraisers, charity quilts–no end to what you can make with little pieces. Fast and fun! I love to make pillowcases. I personalize the fabrics to the recipient. So fun! My favorite small project is a pillow. Sometimes I do a small embroidery project or a wool applique project. A pillow makes a great gift because you can make it just for them with a design they like. I saw this book at my local quilt shop. It is so sweet! Thank you for the opportunity to win a copy. My favorite small quilts are mug rugs and table runners. Small quilts are my favorite projects. Table runners are a fav! My favorite small projects are potholders, table runners and wall hangings in that order. My favorite small projects would be table toppers. Since I’m realatively new, I do t have a favourite small project. I have made a baby quilt. This book sound great. Quick and easy. My favorite small project is throw pillows or the microwavable bowl cozies….although my quilts are usually king size. Right now my favorite small project is table runners. I’m a new quilter and I have lots of ideas for new projects. I see some of the quilters with walls covered in mini quilts…that’s what I want to try next. I love your designs. As for a favorite quilting project I love them all but I do love to make table runners to give as gifts. I teach quilting classes and love to share my knowledge and see what others are doing. I love to make zipper bags and small wall hangings! For a personal gift, I like to do initial runners. Select blocks with names starting with the recipients initials and use their favorite colors from your stash. I like to make greeting cards or small wall hangings. My favorite small projects to create are wall hangings, mug rugs, table runners/toppers and baby quilts. I love to do wall hangings from the Row by Rows. Enjoy making placemats and table runners. I have recently started making mugrugs. I love to make pincushions. They make me happy! I love quilting in general. I guess I make th most of table runners. Some of them go to a cat rescue in Ohio called Friends of Feline rescue Center. They use them to raise funds to support the cats. This book would offer me more ideas to raise more money. I love to quilt, I make everyone quilt runners for gifts, they just love them….I’d love to win the book. Thanks. Love to make mini pieces to hang from the cute wrought iron stands or hangers. Cute and fast gifts. As a newby to quilting, I currently enjoy making placemats and mug rugs … have made a lap quilt. Would live the have the lunch hour pattern to make. I love miniquilts..placemats…flags…lots of small things. I do mug rugs and placements! I love to make small wall hangings for my daughter for the different holidays and seasons. I love the table runner, something I will definitely be making. I enjoy making wall hangings, tote bags and place-mats. I love small sewing projects that combine appliqué and patchwork (such as small hanging mobile type projects, birdies, sachets, etc.) I gift them to grandchildren, and friends’ grandchildren. you offer to your followers. This is a beautiful table runner. When it comes to small quilts, I immediately think of potholders or baby quilts. My favorite small project is to do red work (or blue or green OR whatever) of a holiday, then try new border ideas around it. I use front and back sides – example Halloween on one side and flip it over for Christmas. That way it’s less storage and I don’t have to dig through my trunk to change it out. It is not a quick project, but really worth while. My favorite small project is the soup bowl cozy’s. Love to pick out fabrics that are samples of someone’s personality/favorite hobby and surprise them with it. So much fun to watch my husband give one of his best friends on a week ago…little did we know his friend had just really burned his fingers the day before getting something really hot out of the microwave. He was thrilled!! These are quick and fun! My favourite small project is sitting with my granddaughters who draw and colour their own designs and helping them turn it from a sketch to a finished project. My own small projects are quilt art. Using something like an old ‘Pears soap’ picture and recreating it. Using fabric, watercolor pencils, used teabags to age the fabric by dabbing it on where I need it. Jut sit and loose myself. I’ve actually never done a small project. All of my projects are generally bed-sized quilts. I’ve toyed with the idea, but it just hasn’t happened yet. Maybe this book will be my inspiration! My favourite small projects is something that can be done in a weekend. My favorite small project is making small Quilt tops that I can use for a wall hanging or a table topper. Thanks for sharing your creativity with us! And the give away! This posting came at the perfect time. I’m always looking for 12 1/2″ blocks. Every year, there is a group of relatives that make this size block & my niece gathers them & sews them into a quilt to raffle at our annual Family Reunion. Only restrictions is the size, any style block is accepted, but we usually decide upon a color theme to make them cohesive. This year, the colors are brown, pink & grey – perfect to use on this star. Thank you for sharing this pattern!